As always, click the pix for full size. I am not a big fan of colorizing old monochrome photographs, but still have an interest in the process and try to keep up with the latest algorithms. 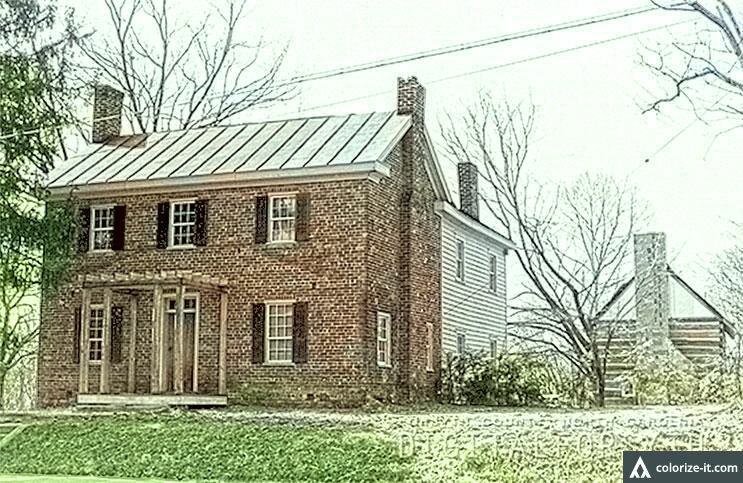 The images in this post have been colorized using Algorithma’s most recent update. The question seemed simple. “How did Depot Street in Winston become Patterson Avenue?” I knew the answer, but of course, it was nowhere near as simple as I thought it would be. Depot Street originally extended only two blocks, from Second Street to Belews Creek. 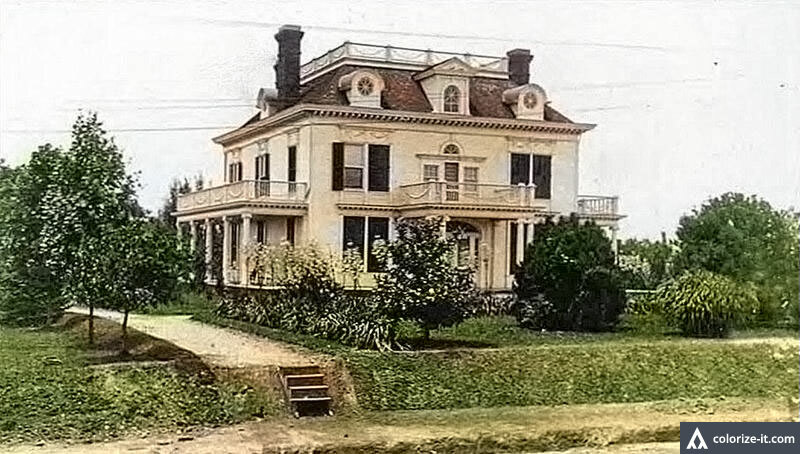 By the early 1880s, it had been opened northward to Liberty Street. Rufus Lenoir Patterson was born with a silver spoon in his mouth, but during his lifetime he turned the spoon gold. His father was a wealthy planter from Caldwell County and also served as the North Carolina state treasurer and the president of the Raleigh & Gaston Railroad. His mother was the daughter of Edmund Jones, a powerful Wilkes County politician; her brother, Edmund W. Jones, became a power in Caldwell as well. And Rufus’s brother Samuel served for a time as the NC commissioner of agriculture. After graduating from the University of North Carolina, Rufus studied law under the legendary John A. Gilmer, but he never practiced, instead deciding to marry Marie Louise “Mary” Morehead, the daughter of former governor John Motley Morehead. After a bit of misdirection, in the early 1850s, in partnership with his father-in-law, he bought the recently failed Salem Cotton Manufacturing Company and converted it to a grist mill. Eventually he also owned and operated a cotton mill and a paper mill as well. In 1860, he was adamantly opposed to secession, but like many others, knuckled under to enormous pressure and voted for secession in 1861. But during the war he was a vocal critic of the Confederate government. Mary Patterson died in 1862. In 1864, Rufus married Mary E. Fries, the daughter of Salem industrialist Francis Levin Fries. After the war, he entered a number of partnerships with Francis Fries’ brother Henry R. Fries and son Henry W. Fries, primarily in the area of textile and paper mills. He was also involved in railroads, becoming a director of both the Western North Carolina and Northwestern North Carolina lines, and treasurer of the latter. 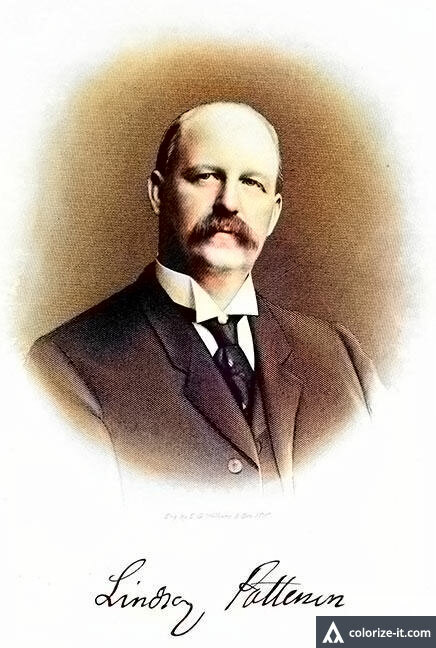 In 1874, he was appointed to the board of trustees of his alma mater, the University of North Carolina. At that time, the school had been closed for several years. Rufus was one of those who worked very hard to reopen the nation’s oldest state university. A number of his children found great success as college professors, inventors and business founders. But the second child of his marriage to Mary Morehead, Jesse Lindsay Patterson, is the one of interest here. Rufus Patterson died on July 15, 1879 at age 49 and is buried in Salem Cemetery. Jesse Lindsay Patterson was born May 16, 1858, the second child of Rufus and Mary Morehead Patterson. He attended the Boys School in Salem, the prestigious Finley High School in Lenoir and graduated from Davidson College in 1878, second in his class. He passed the NC state bar in 1881 and began a 41 year law practice in Winston-Salem. On September 6, 1888, he married Lucy Bramlette Patterson, who he had first met while she was attending the Salem Female Academy. Jesse was known for his elequent courtroom arguments. One of his most famous trials dragged on for years and required several appearances before the state Supreme Court to decide the ownership of the knob on top of Pilot Mountain. But the case that made him famous involved the attempt, in 1901, by the Conservative controlled legislature to impeach two Republican justices of the state Supreme Court. His final argument before the NC Senate is still considered to be the greatest speech ever delivered there and is still read in law schools. Both defendants were acquitted on all charges. 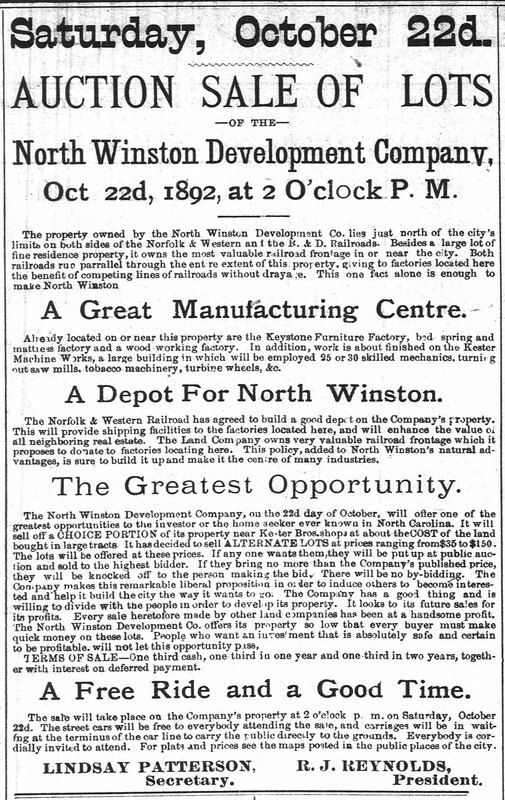 In April, 1891, a group of Roanoke, VA and Winston-Salem businessmen who knew each other from their efforts to build the Roanoke & Southern railroad to Winston organized the North Winston Development Company. 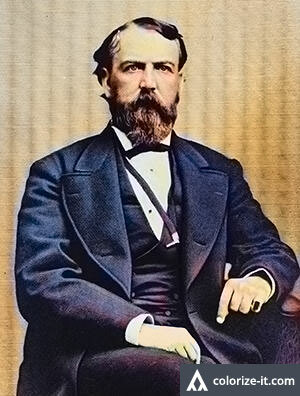 The officers were R.J. Reynolds, president; H.R. Starbuck, vice-president and secretary; and J. Lindsay Patterson, treasurer. They purchased 200 acres of land north of the Winston limit, along the Richmond & Danville and Roanoke & Southern railroad tracks. 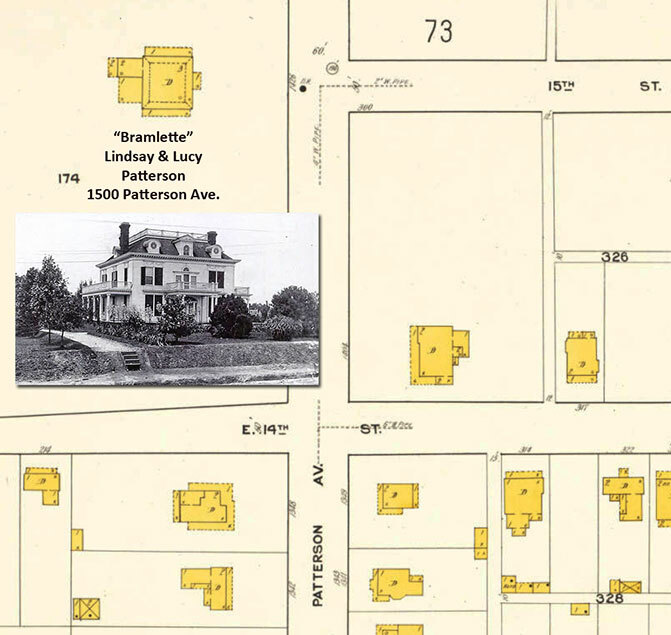 At the same time, Lindsay Patterson bought several dozen acres adjacent to the other tract to the east at the northern end of Depot Street. That area would come to be known as the Bramlette Addition. The two companies petitioned the Forsyth County Commissioners to build a new road, extending Depot Street north of Liberty Street into their area. The commissioners agreed that the road could be built, but not with their money. They did agree to lend a bit of money to the project, at six percent interest. Lindsay Patterson went to Raleigh and convinced the state legislature to put up $300 more for the project. By October of the following year, they were ready for their first auction sale. Their flier mentioned that already operating on the property were a furniture factory, a bedspring and mattress factory and a wood working plant, with the opening of the high tech Kester Machine Works due to come on line any minute. The auction was judged a success, with 38 lots sold at an average price of $113. A second sale was scheduled a few weeks later. The precise date of construction is currently unknown, but at about that time, Lucy Bramlette Patterson built a grand house on the new street at the center of a two block long section between Fourteenth and Sixteenth Streets. She named it “Bramlette”, after her mother’s family, and the name soon became attached to the entire area. 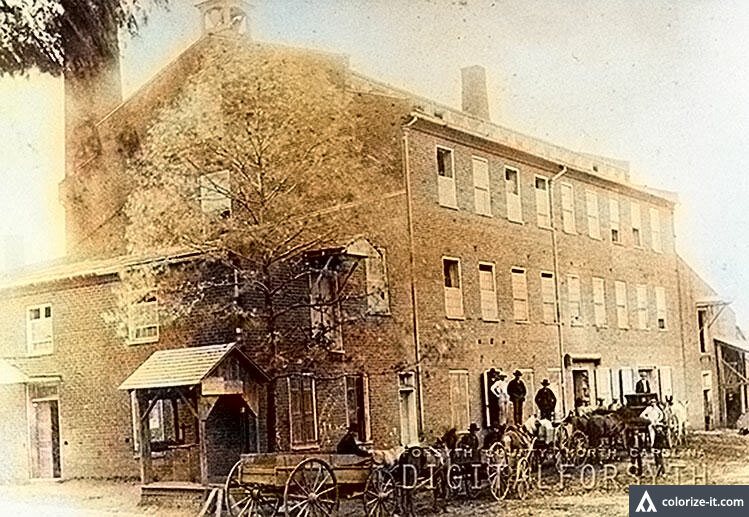 The central house was three stories, with a two story ell in the back. Single story porches adorned the front and both sides, while the back had a two story Bermuda style porch. The new street would be listed in city directories for about twenty years as “Bramlette Addition” before it was officially designated as Patterson Avenue. And the portion south of Liberty would remain Depot Street until 1921. But right away, “Bramlette” became an important center of social and intellectual life in the Twin City. 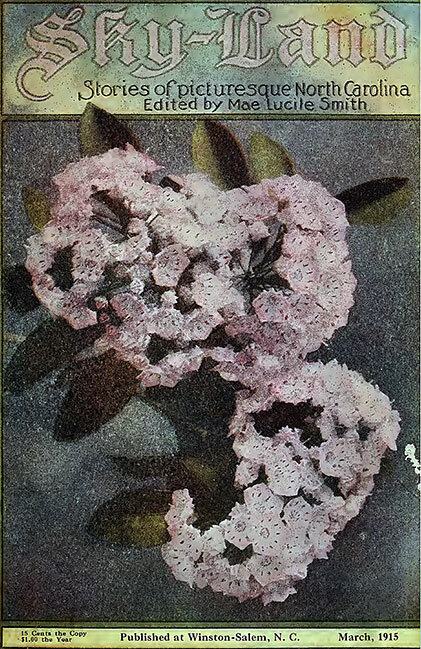 Lindsay Patterson died on November 6, 1922 and is buried in Salem Cemetery. Lucy Bramlette Patterson was born at Castle Rock, her mother’s family home, in Tazewell, TN on August 22, 1865. Her paternal grandfather, Major General Robert Patterson had fought in the War of 1812, the Mexican War and the Civil War (Union). Many other members of her family had distinguished themselves in a wide variety of fields, including politics and literature. Like her mother before her, she attended the Salem Female Academy. But unlike her mother, who received, at best, a certificate of attendance, she received an actual diploma. In 1878, the Academy, under the direction of their first “senior teacher”, Emma Lehman, granted their first high school diplomas. Four years later, Lucy Bramlette Patterson got hers. While at the academy, she met a young man with the same last name as hers, Patterson, as in Jesse Lindsay, who had just graduated number two in his class at Davidson College. They were not related, but there was definitely a spark of interest. Lucy returned to her home in Tennessee while Lindsay was beginning his long and successful legal career. But eventually the spark expanded into a flame and they were married on September 6, 1888. Apparently, it was a match made in heaven. They had no children, but reared two orphan nieces. Lucy was known for her entertaining skills, which made Bramlette parties one of North Carolina’s most sought after invitations. But once her house was in order, Lucy plunged into more serious matters. In May 1902, Lucy issued a call for members of various NC women’s clubs to meet on the campus of the Salem Academy. In those days, women were not encouraged to travel on their own, so only a handful showed up: Sorosis, Round Table, and Embroidery of Winston-Salem; Sorosis of Wilmington; Circulating Book Club of Salisbury; Goldsboro Women’s Club; and Alpha Club of Statesville. 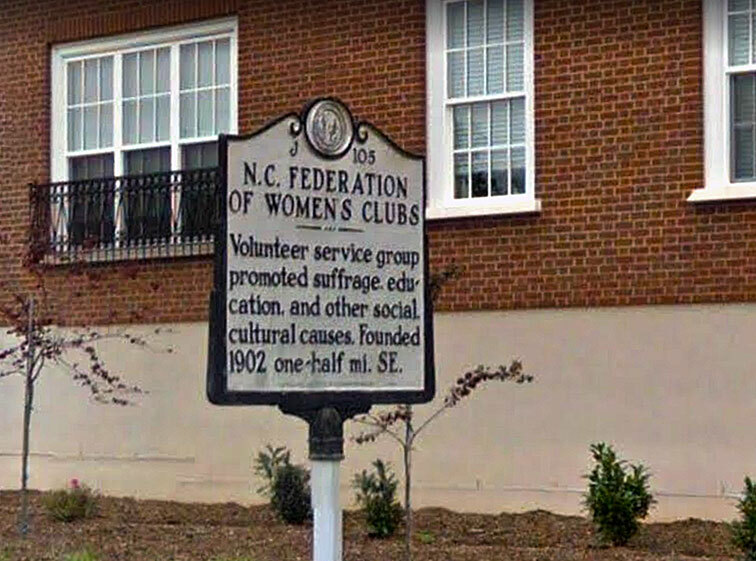 But they established the NC Federation of Women’s Clubs. Soon, dozens of other clubs across the state managed to join. 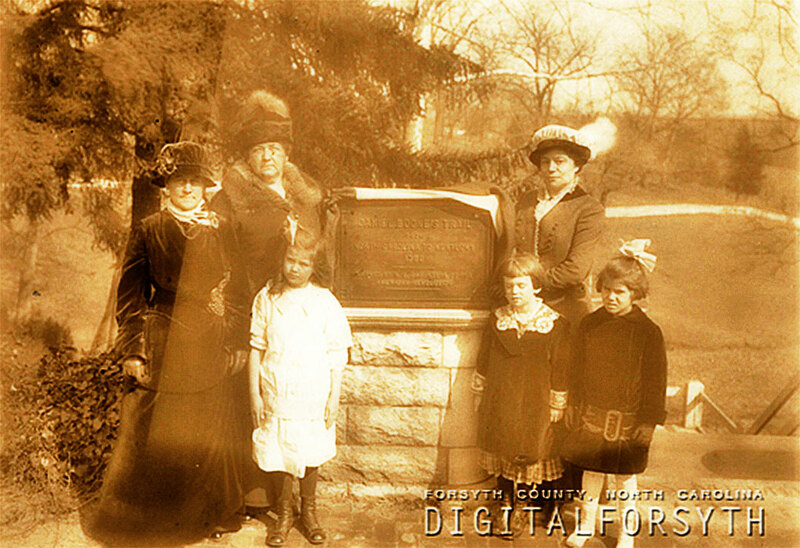 They have been a civilizing force in the Old North State ever since. A North Carolina historic marker commemorating that meeting stands at the corner of South Main and Cemetery Streets in the Twin City. Lucy Bramlette Patterson was elected the first president. Lucy had a special interest in history and literature. 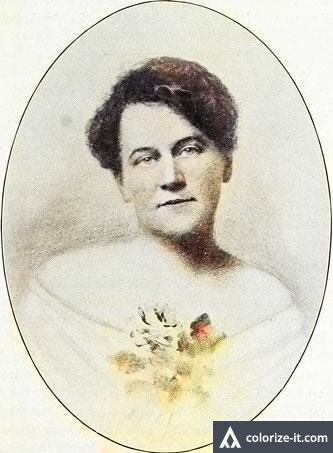 She would become, along with fellow Twin Citizen Daisy Hanes and her husband R.D.W. Connor (SEE https://northcarolinaroom.wordpress.com/2014/03/09/1st-archivist-of-the-united-states/), a founder of the North Carolina Historical Commission and the North Carolina Literary and Historical Society. 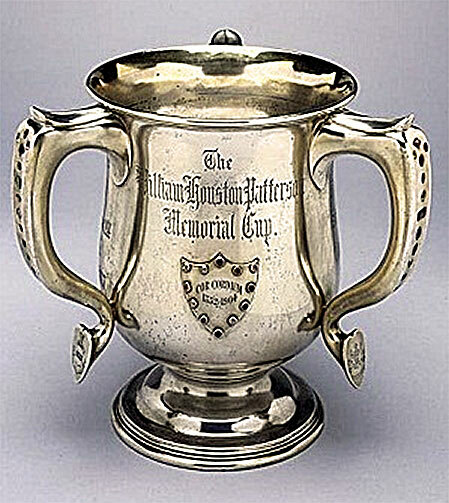 In 1905, she established the Patterson Memorial Cup, to be awarded when justified, for literary achievement by a North Carolinian. For several decades she published essays on a wide variety of subjects in newspapers and in the state literary magazine, “Sky-Land”. She was the organizing regent of the Centennial Chapter (now the Joseph Winston Chapter) of the DAR, served as state regent and was twice elected as national vice-president of the DAR. She also led the DAR campaign to erect a series of markers (not to be confused with the inaccurate arrowhead markers) commemorating the life of Daniel Boone. She also served as president of the Southern Woman’s Interstate Association for the Betterment of Schools and many other education related organizations. She was state chairman of the Jamestown Historical Commission, the Ter-Centenary Shakespeare Celebration and Work Relief in Belgium. The North Carolina exhibit at the 1907 Jamestown Exposition, mostly her work, was awarded one of three silver medals for best exhibit. After World War I, she visited the Balkan countries. She was made an honorary member of Kola Sestera, an organization for the relief of war widows and orphans. She became acquainted with many local leaders, was entertained by Queen Marie of Romania and was decorated for her relief work by King Alexander of Yugoslavia. In 1921, she leased her two city block long estate and house for a month to the local North State Film Company. 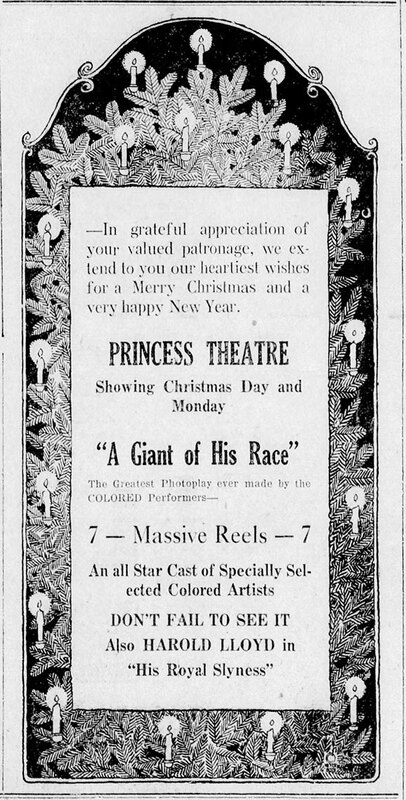 They brought in a professional producer/director and actors from New York and made a feature film, “A Giant of His Race”, a “race movie” aimed at black audiences. The many extras in the movie were mostly local black citizens. The film premiered at the Lafayette Theater on East Fourth Street, moved to the Lincoln Theater in Chicago, then began a long run in Harlem, later moving out across the nation, with at least one more local appearance. And in 1922, less than two years after ratification of the 19th (Suffrage) Amendment, Lucy ran for Congress in the NC 5th District against incumbent Democrat Charles M. Stedman. Colonel Stedman won by about a 2-1 margin, but he spent $1,300 on his campaign. Lucy spent $125. She would go on to serve on the Republican National Executive Committee for about twenty years, first as an associate member and finally as the national committee woman from North Carolina. Lucy died on June 20, 1942 and is buried near her birthplace in Tennessee. So now when you’re driving on Patterson Avenue, you will have a better idea of where that name came from. Next postSummer Reading is almost here!